The most perfect part of a house combines the comforts of home and nature. On rainy afternoons at my grandmother’s, my sister and I found refuge on her porch. A straw mat covered the slate floor, and we’d lie on our stomachs to play Spit and Crazy Eights, elbows growing gridded with the texture of the mat. 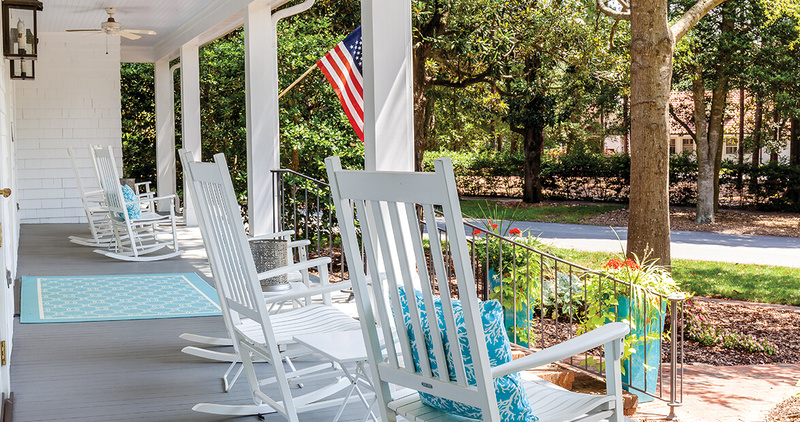 In North Carolina, a porch is a sanctuary, a dedicated living area for a good six months of the year. Porches let the outdoors in, minus attendant nuisances like, well, the sun. From a porch, you can hear children playing, crickets and frogs competing for decibels, the shush of surf or creek or lake. Sleeping porches and sun porches are nice, but not the same as a porch that’s open to the outdoors. In a porch-perfect world, I’d have a covered front porch twined with smilax, where the postman can safely leave packages. Then I’d like a side or back porch, close enough to the kitchen to enjoy meals on. Floor-to-ceiling screens, but with a sunny wooden sill, where tomatoes can ripen. A lamp for reading at night, while moths bash softly into the screens. A pair of chairs would be pleasant, and a glider or sofa, all of which should be covered with something impervious to drippy peaches or jostled morning coffee. A two-seat swing on creaky chains. An overhead fan. If you can arrange for a clematis to climb the downspout, that would be appreciated, as would a gardenia bush growing just outside. Oh, and a corner for a snoozing dog, where paws and tail are safe from rocking chair runners. Now, then: Cue breeze. Feet up. Big sigh. Relax.